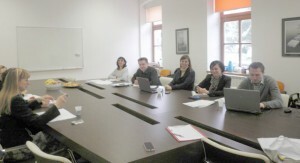 Kick off meeting for the project “Skills forecasting – reverting negative trends in skills and jobs matching” in the framework of the EU ‘s program for employment and social solidarity – PROGRESS, was held on 4th of February 2014 in Technology Innovation Centre Međimurje, Croatia. This was also an opportunity for project partners and other relevant stakeholders on the labour market, from which we expect cooperation, to be introduced with project progress with special emphases on purpose of research and data collecting. Skills forecasting system as a final result will contribute to a better match of supply and demand on the labour market, and will provide decision makers credible information in the field of County development and creation of new employment opportunities. PROGRESS program is a community program for employment and social solidarity, and was established to support the objectives of the EU in the field of employment, social inclusion and equal opportunities in accordance with the Social Agenda. In its focus are activities that have a strong European dimension, and are intended as a form of information and analyzing development policies. The budget for this seven-year program was 743.25 million Euros. The grant beneficiary is Croatian Employment Service Regional Office Čakovec, and partners are Regional development agency REDEA, Science and society synergy institute Čakovec, Znanstveno–raziskovalno Središće Bistra Ptuj and L&R social research Wienna. General objective of this project is to contribute to a better labour market supply and demand aiming to create new employment opportunities. – Employers on the local level. Implementing research to gather data about educational outcomes, employment and unemployment structure regarding level of education and profession. Exchange of good practice and mutual learning in skills forecasting in cooperation with partners on the project. Development of skills forecasting for labour market needs in Međimurska county. Establishment of permanent skills forecasting system for labour market needs and fostering employment growth in Međimurska county. Research results will be compiled in brochure which will help local policy makers in delivering development and employment policies. This project is supported by the European Union Programme for Employment and Social Solidarity -PROGRESS (2007-2013). This programme is implemented by the European Commission. It was established to financially support the implementation of the objectives of the European Union in the employment, social affairs and equal opportunities area, and thereby contribute to the achievement of the Europe2020 Strategy goals in these fields. The seven-year Programme targets all stakeholders who can help shape the development of appropriate and effective employment and social legislation and policies, across the EU-28, EFTA-EEA and EU candidate and pre-candidate countries.